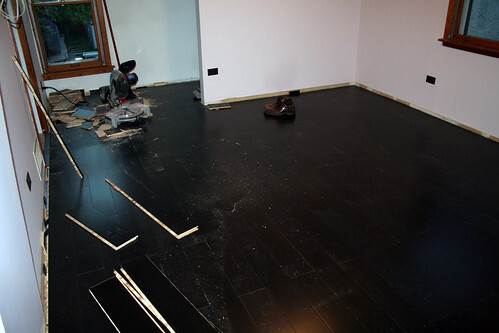 We installed the bamboo flooring this weekend in the studio! We emptied the room, shoving everything into the library and future guest room. Brandon ripped out all of the carpeting, pulled up the baseboards, and removed all of the staples and carpet tack strips from the subfloor. 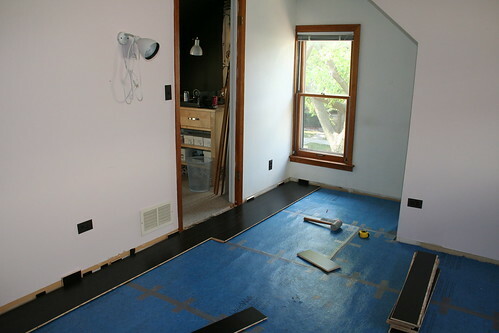 An underlayment had to be rolled out and trimmed to size before the actual flooring could go in. One should use a sharp blade to cut through the material. 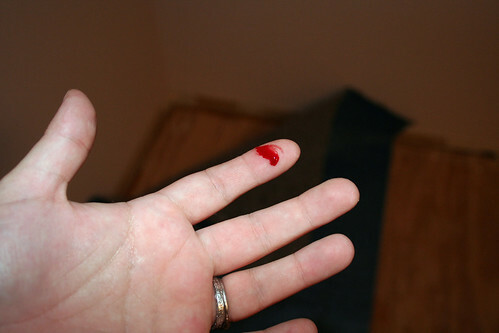 One should also exercise caution when dealing with sharp blades. We started working around 10:00. Two hours later, it seemed we had barely made any progress. The first few rows are the most time-consuming. There’s a lot of measuring and planning to center the planks, and they don’t stay together very well in the beginning. Another three hours later, and we were much further along. By 6:30, we were done! 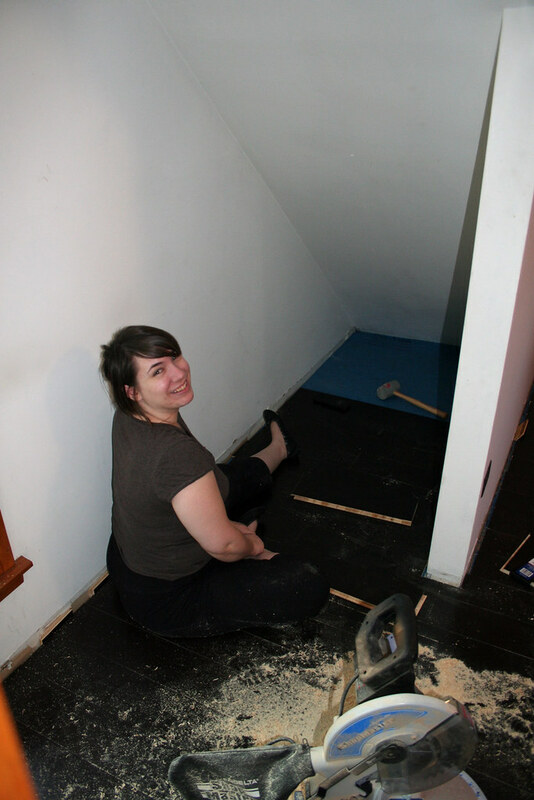 Yes, the bamboo floor took a mere eight or nine hours of hard, hard work (we are so tired). 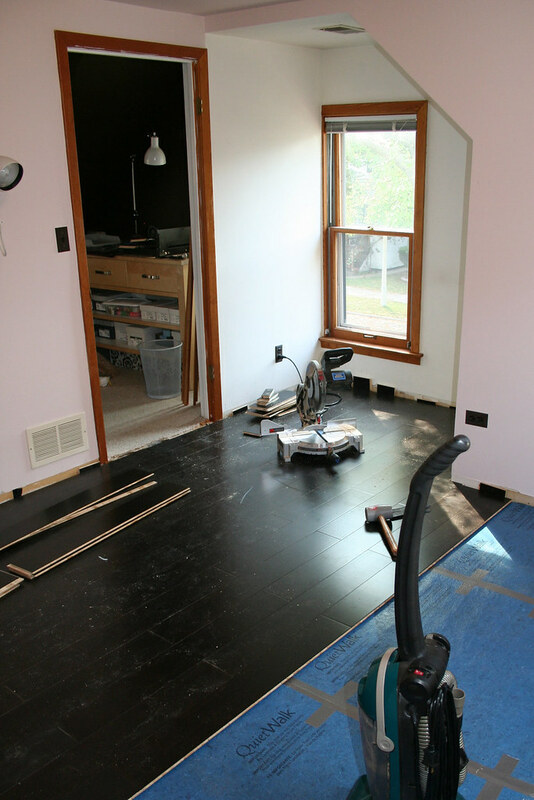 Save yourself some work – prime and paint the baseboard BEFORE you install it. Then touch up after you install it. Much easier then having the crawl along the floor to paint it and dealing with taping everything off. Learned that the hard way. So pretty! I’m envious, but mostly at how industrious you two are! We just don’t have the energy to do much with our bungalow anymore, but paint. So I live vicariously through you. I second Amy’s suggestion. 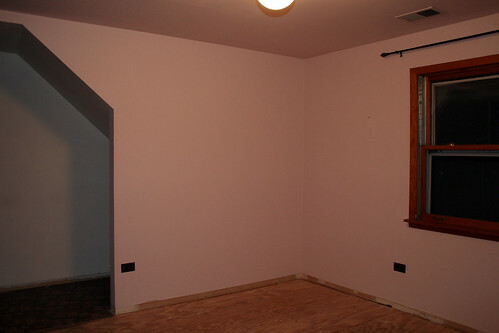 My husband primed and painted all the baseboards, trim, and molding prior to install. It’s the exact opposite of what they tell you to do, but we haven’t had a problem with warping, yet, after 8 years of home ownership (two homes). The floor looks great- good job! it looks fantastic. You two are so inspiring! Nicole, there you go again! I am wanting bamboo floors but did not know they came in such a rich color. Great job! I have been lurking watching you two take on one room at a time, to perfection!